This Ram Horn Shofar is unpolished and features a rough, unpolished body that is colored natural shades of brown, black and white. The Shofar has a large bend in its body by the top and has a smooth, narrow bottom section near the mouth piece. The Shofar is used in Rosh Hashanah as a call for repentance and is also blown to mark the end of Yom Kippur. This item is a perfect gift for the lover of nature! 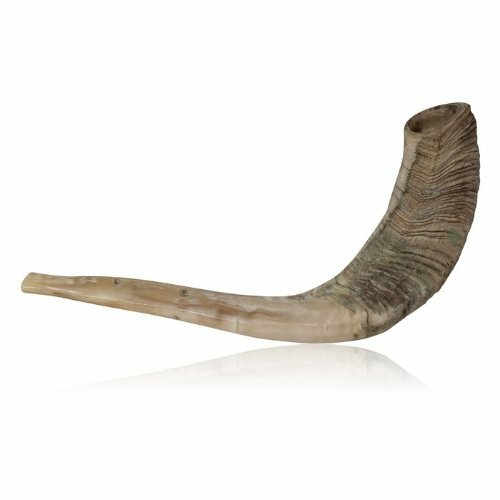 This Ram Horn Shofar comes from Israel and was certified Kosher by the Israeli Rabbinate after being tested and checked. Please note that the size is measured around the outer edge of the bend in the Shofar. Each Shofar is handpicked and tested to ensure high quality. This large natural Ram Horn Shofar features shade of brown and white on its body and has a rough unpolished surface that exudes rustic beauty. View More In Folk & World.